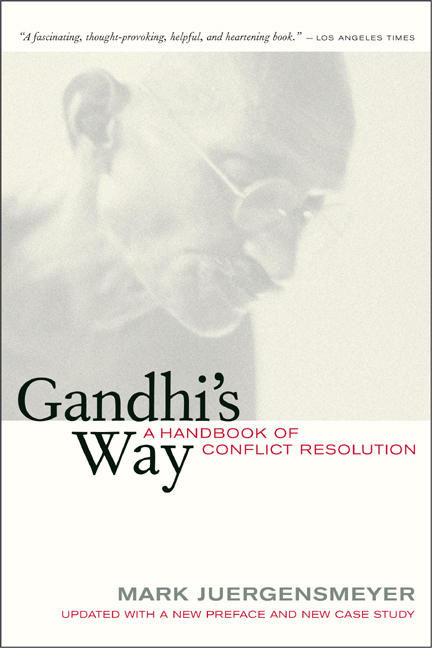 Gandhi’s Way provides a primer of Mahatma Gandhi’s principles of moral action and conflict resolution and offers a straightforward, step-by-step approach that can be used in any conflict—-at home or in business; in local, national, or international arenas. This invaluable handbook, updated with a new preface and a new case study on terrorism in Northern Ireland, sets out Gandhi’s basic methods and illustrates them with practical examples. Juergensmeyer shows how parties at odds can rise above a narrow view of self-interest to find resolutions that are satisfying and beneficial to all involved. He then pits Gandhi’s ideas against those of other great social thinkers in a series of imaginary debates that challenge and clarify Gandhi’s thinking on issues of violence, anger, and love. He also provides a Gandhian critique of Gandhi himself and offers viable solutions to some of the gaps in Gandhian theory. 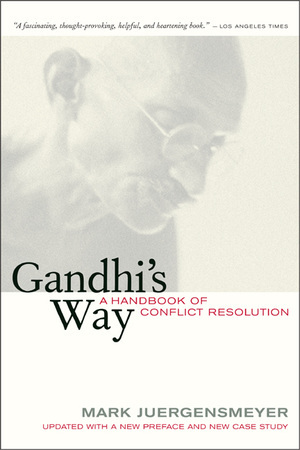 Gandhi’s Way: A Handbook of Conflict Resolution was previously published as Fighting with Gandhi and Fighting Fair. Mark Juergensmeyer is Professor of Sociology at the University of California, Santa Barbara. He is the author of Terror in the Mind of God: The Global Rise of Religious Violence (revised edition, 2003) and The New Cold War? Religious Nationalism Confronts the Secular State (1993), both from California. 2. Why Fight at All? 3. How Do You Know When You're Right? 9. How Do You Know When You've Won?